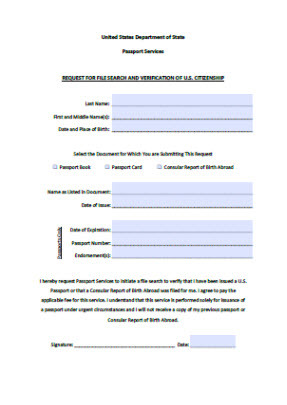 If you have lost your passport, but you have been issued a passport or Report of Birth Abroad in the past, you will be able to request a file search to verify U.S. citizenship when you apply for a new passport. If you have an old passport book or card, and a file search turns up a record of that document, then this can serve as evidence of U.S. citizenship for the purposes of your application. There’s no guarantee that this record will be found, and if the search fails to turn up this record, your application for a new passport will not be completely processed. Unfortunately, the $150 fee for the search is not refundable, so you should make absolutely certain that you have your “ducks in a row,” so to speak, before sending the application. If your situation is not urgent, you will want to obtain primary evidence of U.S. citizenship in advance of submitting your application for a new passport, as this will help to make the whole process considerably less difficult for you and for the people handling your application. A birth certificate or a certificate of citizenship can both serve as proof of U.S. citizenship in order to help you get your passport. If you’re missing your certificate, if you need it replaced, it would be wise to take care of that now before filling out the application. You may also use a naturalization certificate as proof of citizenship. To get ahold of your birth certificate, if you were born in the U.S., you can check with the Department of Health (Vital Records) in the state in which you were born. You can visit CDC.com for further info. When you don’t have the proper paperwork on hand, applying for a new passport can be a trying process. If at all possible, you will want to get your papers in order beforehand. A file search is there as an option to ensure that you won’t be stuck without the requisite papers.